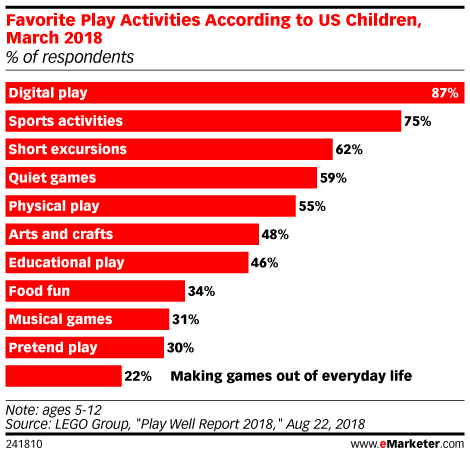 Data is from the August 2018 LEGO Group "Play Well Report 2018" conducted by Edelman Intelligence. 12,972 parents and children ages 18 months-12 years in nine countries worldwide were surveyed online during February-March 2018. Among those surveyed, 9,249 were parents of children 18 months-12 years and 3,723 were children ages 5-12 whose parents had completed the main survey. The first 15-minutes were answered by the parent, with the remaining five minutes answered by their child, undirected by their parents. The nine countries were: China, Denmark, France, Germany, Russia, Saudi Arabia, Mexico, the UK and US. Parents were representative of the general population on age and gender within the countries polled. LEGO Group, part of the LEGO toy company's goal is to inspire play in children and fans.